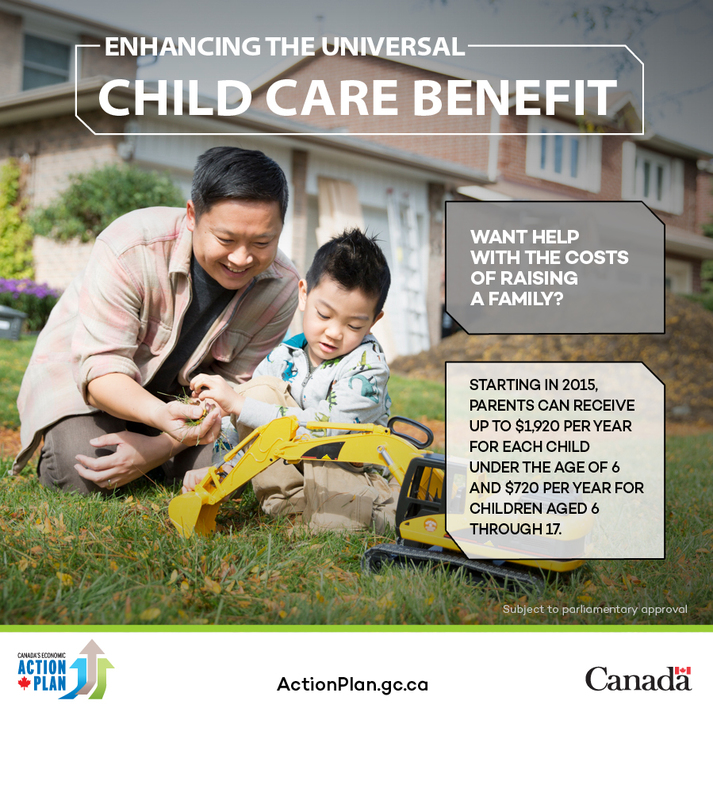 In 2006, the Government introduced the Universal Child Care Benefit (UCCB), which provides all families with up to $1,200 per year for each child under the age of 6. The UCCB currently provides direct federal support to approximately 1.7 million families with young children. Now, the Government is proposing to enhance the UCCB by providing up to $1,920 per year for each child under the age of 6, and introducing a new benefit of up to $720 per year for children aged 6 through 17. The UCCB enhancements would take effect starting January 2015 and would begin to be reflected in monthly payments to recipients in July 2015, pending parliamentary approval of the necessary legislation. The July 2015 payment would include up to six months of benefits to cover the January to June 2015 period. About 4 million families are expected to benefit from these enhancements. These enhancements to the UCCB would replace the Child Tax Credit, starting in the 2015 tax year. Couples with children under the age of 18 can claim a tax credit worth up to $2,000, starting in the 2014 tax year. Starting in 2015, parents can claim $1,000 more each year for the Child Care Expense Deduction. Parents can claim up to $1,000 per child to help pay for their activities.